Alexander Kwang (1908-1964), and Chu Shek-lun were two leading textile industrialists in HK in the 1950s and 1960s who were fellow leaders of the Chinese Manufacturers Association (CMA) and died within 12 days of each other in October 1964. Their children combined their business interests in the 1970s into the listed Success Holdingswhich they ran until cashing out in 1992. Alexander Kwang, whose original name was Cheng Hei-lok (喜樂) but went by his alias of Cheng Kwang in Chinese. His surname was Cheng so probably thanks to the handy work of Australian immigration officials that his first name Kwang became his English surname. A native of Chaoyang (潮陽) in the Chiuchow region, Kwang was born in Swatow in 1908. When he was young, his whole family converted to Christianity and after secondary school, he went to Shanghai to study economics. He first worked in the customs department in Swatow but later moved to Hong Kong to pursue a career in business. In 1932, he immigrated to Australia and upon his return to HK, he established Alexandra James & Co in 1934 as a representative of Australian flour mills and dairy producers. The products which Alexandra James was sole agent for the Far East included “Three Bears” rolled oats produced by Jas. F. McKenzie & Co in Melbourne, “Charity” and “Pyramid” flour made by Wise Brothers of Sydney and “Blue Bell” condensed milk and “Dairypride” milk powder by Gippsland & Northern Co-operative in Melbourne. The business was very successful and by the late 1940s, Alexandra James had branches in Shanghai, Canton, Swatow and Bangkok. Using his profits from trading, Kwang expanded into manufacturing and settled on the field of cotton. (it probably has to do with his connections in Australia, which was an important source of raw cotton) In 1953, he founded Far East Cotton Industries in To Kwa Wan to manufacture cotton related products under the “Kapok” brand starting with cotton yarn. In 1954, Far East began making cotton blankets and by 1955 its daily production was 300, with each blanket selling for HK$18 to HK$35 apiece. The firm also began research & development of medical cotton balls, sanitary mouth masks and tampons in 1955 and became the first factory in Hong Kong to manufacture these products (Ta Kung Pao, 1955-12-6). To expand into these new products, Kwang hired Japanese expert Sheung Tin Sau Kut () as chief engineer and the assistant engineer Wong Chi-kwong was also trained in Japan. By 1957, Far East was producing 1000 pounds of cotton balls (selling for $2.8 per pound, which was much cheaper than the imported ones at $4 per pound), 3500 boxes of tampons ($1.60 per box vs. imported ones of $3 per box) and 300 cotton blankets daily. The manufacturing operations was comprised of two locations –the main factory in Kowloon City (near the pier) and the washing operations in Lo Fu Ngam (now Lok Fu, near Wong Tai Sin). 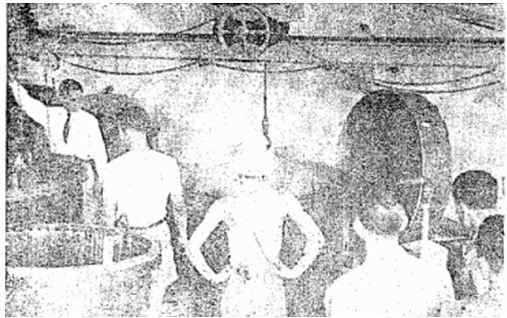 The plant in Lo Fu Ngam had about 100 workers and was responsible for processing raw cotton. The process involved 4 hours of steaming and washing to remove cotton fat and then bleaching using chemicals and drying using machines. The plant had daily water usage of over 100,000 gallons and featured the largest water pump in HK capable of sucking in 20,000 tons of water per day. (KSDN, 1957-1-16) There was also a 10 feet wide and 24 feet deep water well.The interior ofblankets comprised of cotton waste, some of which procured from other cotton mills in HK but Far East also imported 30000 pounds of cotton waste from Australia per year. In March 1964, Far East ordered new spindles and its monthly production exceeded 2000 bags of cotton yarn. (KSDN, 1964-3-21). According to the HK $ Directory, by that time Far East’s factory was located at Lot 685, DD 445 in Kwai Chung.According to Asian Industrial Development News in 1970, Far East Cotton Industries had 12,240 spindles and 32 looms, placing it as one of the smaller cotton spinning mills in HK but the firm stood out as the only Cantonese proprietor in the industry which was dominated by Shanghainese interests. Outside of work and his involvement with the CMA, Alexander Kwang was chairman of the Chiuchow Chamber of Commerce and the Cheng Family Association. On October 30, 1964, Kwang died of a sudden illness at the St Teresa’s Hospital in Kowloon. 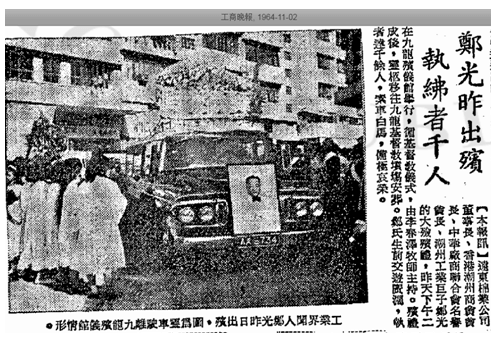 His funeral at the Kowloon Funeral Parlor was attended by over 1000 and he was buried at the Chinese Christian Cemetery in Kowloon City (Kung Sheung Evening News, 1964-10-31). Alex Kwang had five sons and three daughters and his five sons – Henry Cheng Hin-fei (鄭慶飛), Cheng Hok-wai (鄭學偉), John Cheng Hok-king (鄭學經), Paul Cheng Hok-yee (鄭學義) and James Cheng Hok-lai (鄭學禮) – succeeded him in business. Henry studiedmechanical engineering and business in Canada and just returned to HK to join the family business months before his father died in 1964. In 1971, Henry established a metal factory in Canada, taking advantage of Canadian government subsidies which provided up to a third of the startup costs. (WKYP, 1971-7-30) According to another article in 1973, the family also had investments in properties and the food industry in the US and Canada. (Kung Sheung Daily News, 1973-2-27). A graduate of Pui Ching Middle School, Cheng Hok-wai (鄭學偉) was sent to Takushoku University (拓殖大学) in Tokyo to study textile in 1961 and became a director and later managing director of Far East Cotton after he returned. 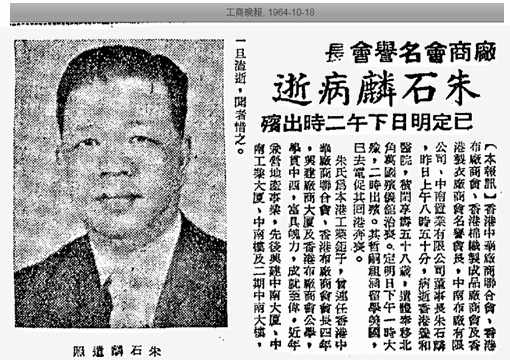 (華僑日報, 1961-04-12) In 1966, Hok-wai started New Territories Godowns Ltd (新界貨倉) with Chan Cheung (陳章) of trading firm Chingman&Sons Ltd (義德洋行) and warehouse industry veteran Tin Sun-kiu (田新橋). 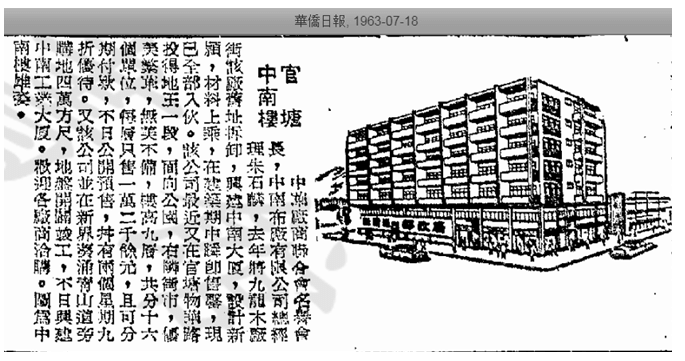 The firm built a 6 story, 180,000 sq ft godown on Yeung Uk Road in Tsuen Wan(香港工商日報, 1966-03-29) but was dissolved in 1997. Chu Shek-lun, the founder of Chung Nam Weaving, was a native of Jiujiang county in Nanhai prefecture (南海九江) in Guangdong. His father Chu Wai-sang (朱偉生) came to HK and established the Chinese banking firm of Shen Yu Ngan Ho (慎餘銀號), which was comparable in size to banking firms started by fellow Nanhai natives such as Tang Tin Fook (founded by Tang Chi-ngong, the father of the famous philanthropist Sir Tang Shiu-kin) and Sui Kut (partly owned by the family of Fung Kong-Un, see article on Fung Tang). Shek-lun joined his father’s business at an early age and was a sub-manager of the bank but when the Japanese invaded Manchuria in 1931, he established his weaving mill business as part of the patriotic movement to make Chinese products and boycott Japanese ones. The press release of Success’ acquisition of Chung Nam in 1973 stated that Chung Nam was founded in 1932 but the memorial plaque at the HKWM school named after Chu stated that the original firm which Chu founded was calledSouthwest Weaving Mill (西南布廠) which was re-organized as Chung Nam after the War. Yet another article in the Trade Bulletin in 1959 Trade Bulletin stated that Chung Nam was established by Chu in 1936. In 1940, Chu and fellow weaving mill owners formed the HK Weaving Mills Association (香港織布業同業商會) and he served as its inaugural vice chairman. Business was suspended during the Japanese occupation but resumed after the War. As of 1949, Chung Nam Weaving operated out of 2 Mok Cheong Street, Tam Kung Road in To Kwa Wan with Chu at the helm of the business and Dr. Hawkins Yew in charge of exports of its “Lighthouse’ and “Penguin” brands of cotton fabric. In 1956, Chu became chairman of the HK Weaving Mills Association during which he successfully lobbied the HK government for more garment quotas for the industry, organized the construction of the HKWM School and was appointed to the Cotton Advisory Board(香港棉織業諮詢委員會) in 1961. He also became the chairman of the CMA around the same time and during his tenure he led the effort in the construction of the CMA building in Central and trade negotiations with counterparts in the UK and beyond. By the 1960s, Chung Nam had over 300 workers and was manufacturing over 10 million yards of cotton fabric (WKYP, 1966-8-20). As the HK real estate market began to take off in the late 1950s, early 1960s, Chu Shek-lun formed Chung Nam Land Investment Co Ltd (中南置業有限公司) in 1961 and re-developed the firm’s factory site in To Kwa Wan into a residential building by the name of Chung Nam Mansion (中南大廈) and relocated its manufacturing operations to a new factory building in Kwun Tong. The success of Chung Nam Mansion prompted him to develop more properties – including Chung Nam House (中南樓), a 9-story, 16 units building at 79 Hip Wo Street in Kwun Tong and Chung Nam Industrial Building (中南工業大厦) on a 40000 sq ft site on Castle Peak Road in Kwai Chung. After the deaths of Kwang and Chu in 1964, their relatively young children (in their 20s) took over their respective family businesses and kept them intact. In 1972, the two families decided to join force and incorporated Success Holdings with HK$100 million in registered capital, Henry Cheng as chairman, Lawrence Chu as vice chairman, Cheng Hok-wai as managing director and John Cheng and Pong Kin-cheung as directors. The firm went public on the Far East and Gold & Silver exchanges in November 1972 with Liu Chong Hing and HK Chinese Bank as underwriters, selling 7.5 million shares at HK$1 per share. (WKYP, 1972-11-5) At the time, the firm’s primary assets were its industrial buildings in Kwun Tong and Kwai Chung which were generating rental income of $2.3 million. Within months of the IPO, the Cheng and the Chu families injected their family businesses – Alexandra James and Chung Nam Weaving into Success Holdings. The first transaction was Alexandra James which was acquired by Success in December 1972 through issuance of 14 million new shares. At the time, Alexandra James had 30000 sq ft of factory space and did $1.6 million in after tax profits in 1971, $1.9 million in 1972 and projected to earn $2.2 million in 1973 (WKYP, 1972-12-11). Next was Chung Nam which was acquired in February 1973 by issuing 9 million new shares. The firm had 50000 sq ft of factory space and did $1.7 million in profits in 1972 with success in the corduroy business through its affiliate Chung Tien Textiles (中天紡織有限公司) which was incorporated in 1972 (dissolved in 2002). By 1980, Lawrence Chu had replaced Henry Cheng as chairman of Success Holdings whilehis friend Albert Kwok (郭志匡), the chief manager of Wing On Bank had joined the firm’s board and became its vice chairman and Lawrence’s brother Albert who had joined Chung Nam after graduating from Pepperdine in 1972 also joined the board of Success in 1983. 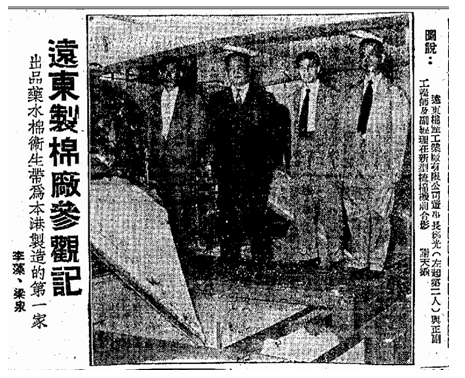 In the early 1980s, the textile business was losing money although the group’s portfolio of properties such as the new Chung Nam Centre in Kwun Tong which was completed in November 1982 and valued at $111 million were doing well (Kung Sheung Evening News, 1983-2-6). During the 1980s, Lawrence Chu served as chairman of the CMA and in 1987, he and his family sponsored the establishment of the HKWMA Chu ShekLun Secondary School in memory of his father. The same year however, he was charged with conspiring with the late Albert Kwok (who had died in California in 1985) to defraud Wing On Bank, which collapsed in 1986. In August 1988, Chu was convicted of four counts of conspiracy and was given a 2-year jail term but in February 1989, the conviction was overturned at the Court of Appeals. Left to right: Eric P. Ho (何鴻鑾, then Director of Industry & Commerce), Lau Sai-yan (劉世仁) of Kong Sun Weaving, Lawrence Chu and Lee Yuk-lau (李毓流) at the unveiling of the HK Weaving Mills Association School in 1975. As for the firm, Success sold Alexandra James & Co for $5.6 million and land in Kwai Chung (KIL 695, 700 and 703) for HK$39.5 million in March 1987. (TKP, 1987-3-6). 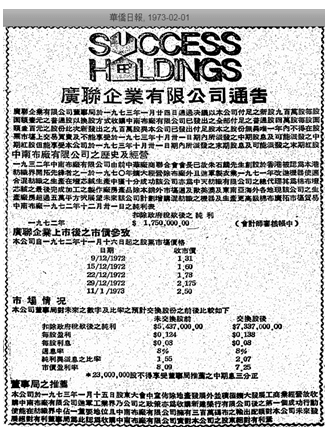 In December 1988, Lawrence Chu launched a bid to acquire all outstanding shares of Success Holdings in an effort to privatize the firm at HK$2 per share. At the time, he and his wife controlled 43.4% of the firm (TKP, 1988-12-2). In an interesting turn of events however, Chu sold 32% of Success to fellow textile merchant Tony Lau Hon-chung (brother of former Legislative Councillor Sophie Leung Lau Yau-fan) for HK$50 million at the price of $3 per share several months later in February 1989 and retained 11.3% with his wife (TKP, 1989-2-10). The same year, he and his brother Albert stepped down from the board.In 1992, ITC (controlled by Charles Chan) acquired Success Holdings (Tony Lau was charged with insider trading for tipping off his mistress right before the acquisition) and over the past two decades, the listed shell changed hands several times with the current listed entity being National United Resources Ltd. Success Insurance was acquired by Koa Insurance from Japan. Henry Cheng died in 1991 and he was survived by two sons, one of whom Jose Cheng is in charge of Fung Capital Asia, the private investment arm of the Li & Fung group. James Cheng served as non-executive director of Guangdong Tannery from 1996 to 2005 while Cheng Hok-wai runs Evergreen Securities and was fined for FRR breaches. As for Far East Cotton Industries, the firm is an ongoing concern managed by Yu Jer-huan (虞哲奐). As a firm, Chung Nam Weaving was incorporated in 1956 and dissolved in 2013. This article was first posted on 12th November 2018.